Art Donovan writes, "I've created a current collection of illuminated designs that take cues from just about every global, antique influence I can find. My latest work, 'The Most Excellent Rumi Redux' stretches my sources just about as far as I've gone yet." We've featured a lot of Art's excellent work before. Mr. Donovan’s newest design, “Rumi Redux”, uses influences from the 13th century Persian poet, Rumi. The imagery (and Arabic calligraphy) is inspired by the famous 12th century Persian scientist, al Jazari. The crown art is entirely hand painted in gouache and gold leaf with translucent dyes used for the back-lit elements. The back-lit, glowing “Eye” is inspired by an early 19th century painting from an English masonic lodge. The comet is reproduced accurately from the 16th century German, “Wunderzeichenbuch” (The Book of Miracles). The Persian elephant is reproduced from an early illuminated text and the crescent moon is 2" thick, frosted convex lens- which is then back-lit and rear painted in deep red to evoke earth shine. The solid mahogany base is painted in pale matte gray with hand made brass and silk tassels. 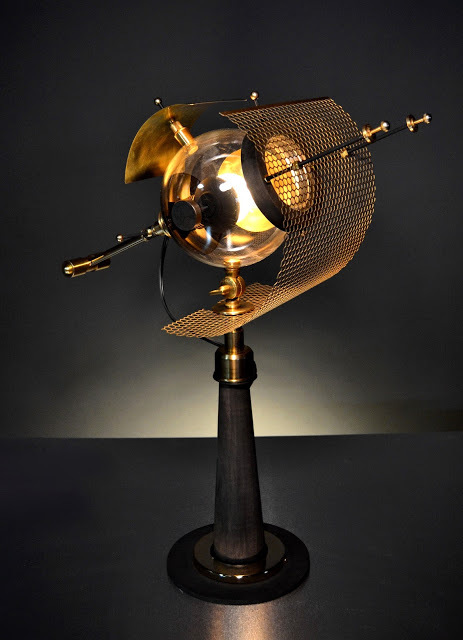 Art Donovan sez, "Created entirely of raw brass, the Dutch artist Jos DeVink creates masterpieces of kinetic sculptures in his Stirling Engines. Turn on the sound, too!" I disagree about the sound, to be frank, but I couldn't agree more about the sculpture. Holy awesome. 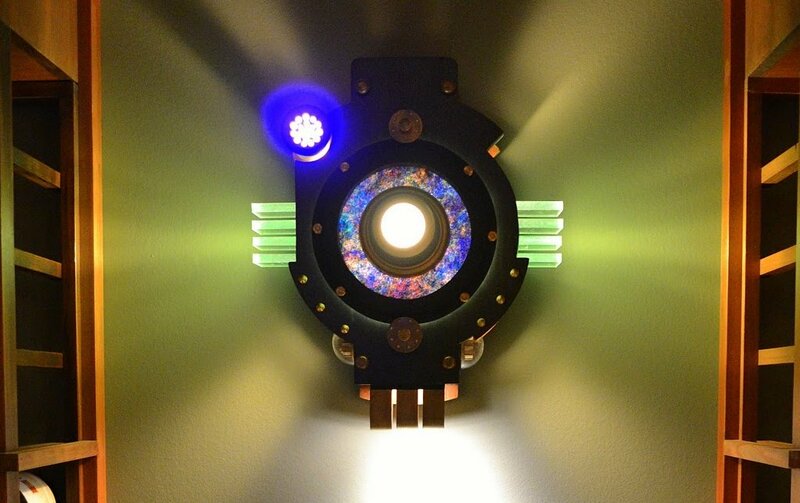 Designer Art Donovan has a lovely line of handmade steampunk lighting that he sells direct (inquire within, as they say). No idea how they're priced, but they sure are purdy. Art Donovan from the Oxford University Museum of the History of Science sez, "I have been given the great honor of curating the world's very first Museum Exhibition of Steampunk Art. Seventeen artists from seven countries- The Steampunk creators that you know best. Opening October 13, 2009 and running continually through February 21, 2010. The Museum Director, Dr, Jim Bennett has scheduled events, art competitions and lectures through the exhibition." Steampunk maker Datamancer has just unveiled his latest, a PC called "The Archbishop" that knocked my socks off. I have one of Datamancer's steampunk keyboards at my office and it's just fantastic -- a clicky-clacky pleasure to write on. 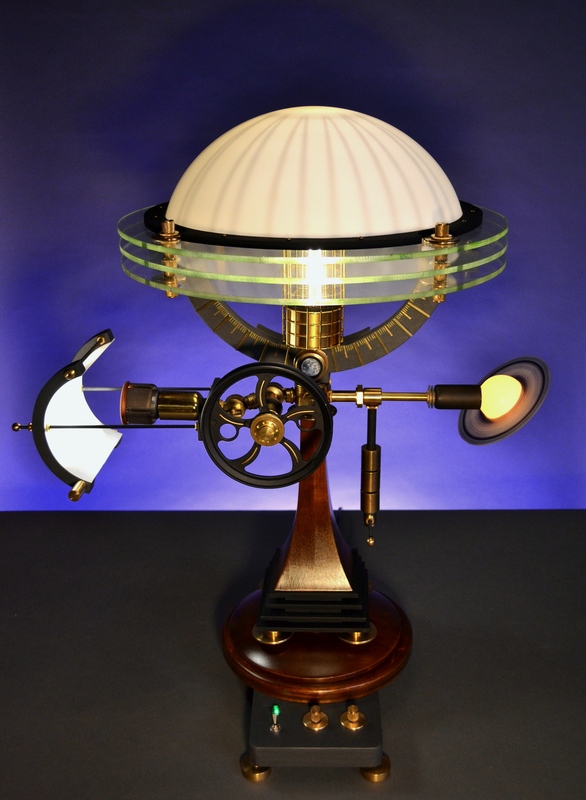 Steampunk maker Art Donovan has just finished a whole whack of fantastic steampunk lamp designs. These are illuminating in the extreme.